I'm not sure how Axevyper came up with their band, but it does sound very "metal." The Italian band has been active for seven and return with their third long-player, Into The Serpent's Den, for Germany's Iron Shield Records. For their sound, Axevyper's musical style is traditional heavy metal, akin to NWoBHM, with large emphasis upon speed metal. Many of the songs here move at a swift, galloping, pace. If a song doesn't suggest some speed at the start, like Beyond The Gates Of The Silver Key for instance, don't worry, you'll get to it. Yet, it's also a song that can moderate the tempo as well. Another song that follows a similar motif is The Adventurer. At the start, it's a rather benign combination of subtle electric and acoustic guitar, until rip open a third of the way in. After this, there's a strong twin guitar presence for harmony, but it's not clear if Guido Tiberi and Damiano Michetti share lead solo duties. But, nevertheless, the solos abound throughout, being frequent and fiery. Something of considerable interest is the definition the bass line gets in nearly every song. A definite presence throughout, the bass gets a solo in the second half of Brothers of the Black Sword and Soldiers of the Underground. Both of which are fine examples, once more, of Axevyper's need for speed and thrilling guitar solos. The production value is also rather solid, perhaps accounting for your ears to pick up the bass line so easily. All in all, for traditional "keep it true" heavy metal Axevyper and Into The Serpent's Den are right on target. If you long for the heady days of mid-period Iron Maiden, you dig this album. 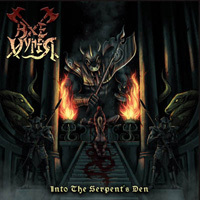 For traditional "keep it true" heavy metal Axevyper and Into The Serpent's Den are right on target. If you long for the heady days of mid-period Iron Maiden, you dig this album.